A Russian presidential aide said special attention would be given at the BRICS meeting to issues relating to the reform of international financial institutions, specifically, redistribution of IMF quotas. The leaders of the BRICS countries will meet before the G20 summit in Brisbane, Australia, Russian presidential aide Yury Ushakov said, according to Interfax. According to the report, Ushakov said special attention will be given at the BRICS meeting to issues relating to the reform of international financial institutions, specifically, redistribution of IMF quotas. “The BRICS countries favor prompt implementation of the 2010 agreements as the most just and meeting the modern economic reality,” he was cited as saying. The report added that the meeting will also address international issues, specifically, the intensification of the interaction between the BRICS countries in the settlement of regional conflicts, issues relating to the non-proliferation of weapons of mass destruction, counterterrorism, drug threat, and international information security. Ushakov was cited as saying that Russia plans to give attention to trade expansion and increasing technological and industrial cooperation. Ushakov said the gold and currency reserves of the BRICS countries are approaching $5 trillion and the amount of mutual trade within BRICS had almost doubled in the past five years, from $170 billion to $300 billion. Ushakov reiterated that the upcoming BRICS meeting is especially important to Russia because Russia is the next chair of the organization. “The next BRICS summit will be held in Ufa on July 8-9, 2015, simultaneously with the SCO summit,” he was cited as saying. The biggest achievements of the BRICS 2014 Summit in Brazil were the establishment of the grouping’s developmental bank and the contingency currency fund. 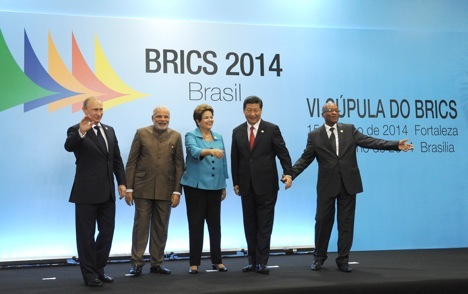 BRICS is also emerging as a political grouping from being an economic one. Several countries have expressed interest in joining BRICS including Indonesia, Egypt and Argentina. Although immediate expansion has been ruled out, the grouping has kept the option open for the future. Based on an article, first published by Interfax.